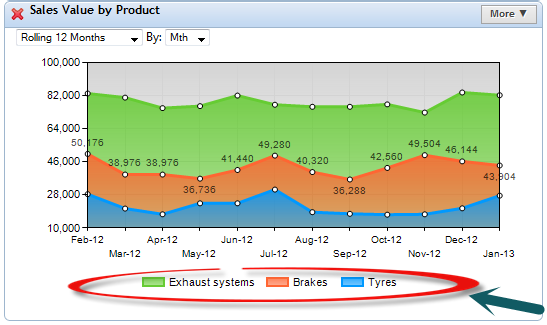 A KPI dashboard’s main purpose is to make trends in KPI data easy to recognize and understand. Therefore, it’s best to consider how those who are using your dashboard would use it, rather than only for yourself. Doing this is not as easy as it sounds, and isn’t just a case of using the right charts for your KPIs. To ensure that important data is communicated in the best way possible, dashboard designers should consider using visual aids to add further clarity to their dashboards. These might not be immediately recognisable to users, but they can go a long way in aiding their understanding of their KPI trends. This article will detail several ways in which you can use online kpi dashboard software to make your KPIs more easily read, therefore allowing the best decisions to be made and action to be taken quickly. When trying to emphasise any information, an effective way to do this is through contrast. This is often done by changing colour (hence why highlighter pens have their moniker). 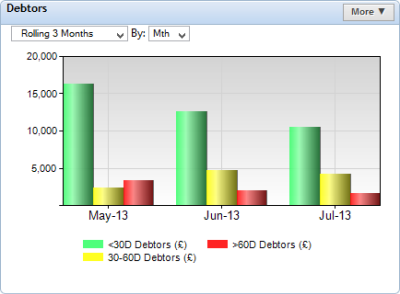 Dashboard software usually gives users control over colours in dashboards and charts, which can draw attention to specific parts of a chart with multiple KPIs. 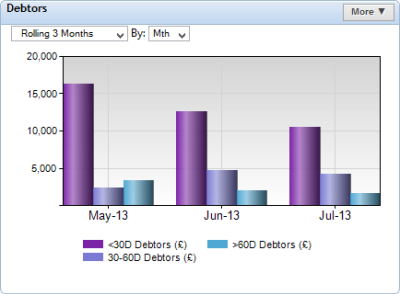 To give you a quick example, here’s a grouped column chart depicting three sets of debtors in an insurance company. Here, each column blends into the next due to similar colouring. By changing the colors of the columns to contrast each other, we can clearly emphasise each KPI in turn, making the chart easier to read. Quite an improvement, if I don’t say so myself. However, if your dashboard software allows it, you can make these colour changes even more apparent by changing the colour scheme of your entire dashboard. If you notice in the above chart, the background of the chart is white. Depending on the display of the computer screen which this chart is shown on, the brightness of the white backdrop can result in the columns being less distinguishable if light colours are used. A solution to this can be to invert the colour scheme of your dashboard, i.e. changing a light background to a darker one. 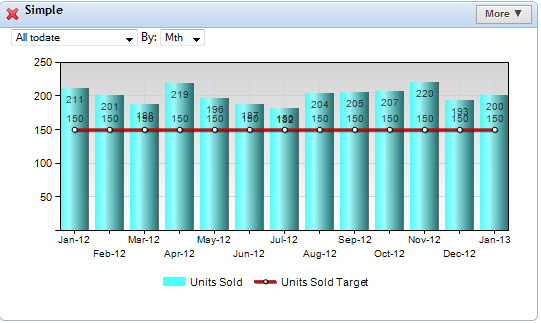 Here’s the same chart with its colours inverted, as used in Target Dashboard. The black background used here adds clarity to the bright colour of the emphasised column. For me, this inverted colour scheme is far better on smaller, high resolution displays such as smartphone screens or iPads, as it’s less jarring on my eyes, while also adding a modern sheen to the dashboard. A quick note on using an inverted colour scheme though: the effectiveness of black over white doesn’t just depend on the platform you’re viewing. It also depends on what you intend your dashboard to be used for. 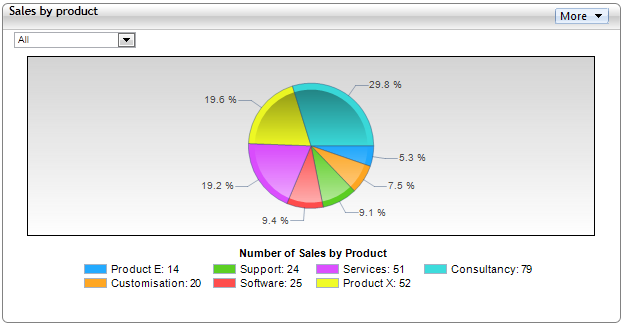 Dashboards are primarily used for giving managers important KPI information which is understandable at a glance. This is usually because managers don’t have time to pore over a dashboard (that’s what management reports are for, and even then, sometimes only the executive report is read! ), and so they have to skim the dashboard for the information they need. The human eye responds best to white text/images on a black background for skimming (as the eye is drawn to the contrast), but actually is less stressed by the opposite (classic black on white) when analysing the information in detail. Therefore, before automatically switching to an inverse colour scheme, consider if your dashboards will need analysis (as it may do in a presentation). 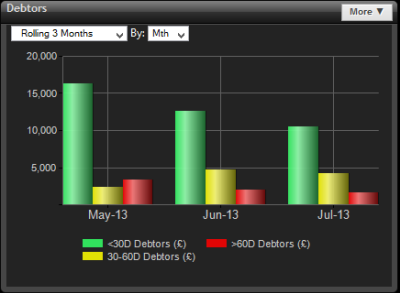 For more information on using colour in your dashboards, you’ll find this article from Perceptual Edge really helpful! Again, this may be obvious to readers, but sometimes notating your charts can result in your chart actually being less readable. But, if you consider what each annotation has to offer your chart, you’ll be able to recognise when it’s best to leave them alone. Many people (including myself, in the past) choose to show the measure values for all the KPI&apos;s in a chart, as theoretically, providing the figures alongside the visualisations should give users all the information they required. However, this is sometimes not needed, depending on what you wish to show in your chart. Let’s take a look at this chart, which depicts sales figures against a target value which increases every three months. As you can see, it’s a little difficult to glean information from this chart. Though the main purpose of the chart is to see how much the sales figures have exceeded their targets, the values for each individual value on both KPIs clash with each other, creating clutter. If I remove the values for the target lines, the chart is easier to read. If you need the Target to be shown, you could list in the chart title. However, since these Targets are easily discernible by the axis intervals, adding them wouldn’t really add anything to the chart. Much like showing values, legends can add clarity to a chart by defining the individual elements in multiple-KPI chart. However, there are instances where legends can clutter up your charts. 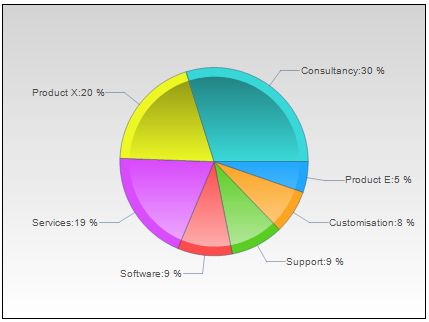 An example of this is when using Pie charts, where the legend is usually displayed alongside the chart. This same chart can be displayed without the legend, but with the values still in place. This means that the user doesn’t need to refer back to the legend to read the chart, as the information is now kept in one place. Also, be mindful of where you place your legend on a chart. If your legend is placed in a position outside your chart, it will often make the chart slightly smaller on a dashboard. If you’re not going to combine many KPIs into a single chart, it might be appropriate to use the space inside the axes of a chart for your legend. Sometimes, using the best charts for your KPIs in a dashboard isn’t enough to get your message across. Visual aids in dashboard software can allow you to tailor your dashboards to be more understandable through relatively simple measures. However, while these techniques can be very effective, they are far less useful without an understanding of the users of your dashboard (if you aren’t using your dashboards for yourself). If you have the opportunity to find out which visual aids assist your dashboard users best, taking the time to tailor your dashboards to their needs will go a long way to making your dashboards as effective as possible. To learn more about how you can make your dashboards communicate your KPIs better, take a look at our Dashboard best practice guide, or take a guided tour with us!